Do you listen to the John Tesh “Intelligence for your Life” radio program? I like it. Every few minutes they have some helpful bit of information about life, work, family, health, relationships and all those other little topics that many of us are trying to figure out in order to make our lives a little easier and more fulfilling. Although John doesn’t have a specific heading for Environment on the list of topics he covers (as listed on his website), I did find all of this great information on his site to keep in mind while we are tending to our lawns. Here is my list of Top Ten Tips from Tesh about Intelligence for Your Lawn. John’s tips are in black (along with The topic they are filed under on their website). My hints are listed at the end of each item. Don’t wear your shoes into the house (Health & Well-Being) . Dr. Mehmet Oz says that shoes track in all kinds of germs, toxins and chemicals, including E. coli, lead, cancer-causing coal tar from asphalt, and lawn pesticides, which are linked to cancer, neurological problems, and reproductive disorders. So, leave your shoes by the door. My hints: For more on this topic, see my post on Organic Gardening for Babies. Lawn care (Money & Finance ) - North Americans spend $50 billion a year to beautify their yards, and that figure doesn’t include water usage. Keeping your lawn green all summer can account for as much as 80% of your water bill, and about half of that water goes to waste. The fix: Keep your grass at least three inches high. It keeps more moisture in the ground, and leads to healthier grass. Limit your lawn’s weekly intake to one inch of water. To keep track, leave an empty aluminum can on your lawn, with the inches marked off. Keep an eye on how fast the water rises from sprinklers, hoses, and rainfall. My hints: See our posts on water conservation for more tips. Lawn mowers (Health & Well-Being). According to Dr. Richard O’Brien of the American College of Emergency Physicians, the lawn mower is probably the most dangerous tool around the house. Studies show that 74,000 yearly emergency room visits are due to lawn mower injuries. Mostly from debris flying into the eyes or body of the person using it, and injuries involving the blades – including the loss of toes or fingers. To stay safe, remove all twigs, sticks and rocks before mowing. Wear closed-toed shoes, long pants and safety goggles. Don’t depend on sunglasses – they won’t block debris from hitting your eyes from the sides. Also, wear ear plugs so you don’t damage your hearing. My hints: Better yet, check out the LawnReform website to find out alternatives to lawns. Lawn chemicals can pollute your garden hose. (Home & Food) - Another landscaper recalled a man who treated his lawn with his hose attached to a fertilizer container. Afterwards, he unhooked the hose and took a drink. Because toxins had migrated back up the hose, he got a mouthful of poison. The fix: Make sure your fertilizer container has a backflow-prevention device. To be safe, run the hose for two minutes after removing the container to flush out leftover toxins. My hints: Better yet, skip the chemicals all together! The best time to water your lawn. (Random Intelligence) If you want the greenest yard on the block, sprinkle it in the early morning, right at dawn. That’s according to Charlie Nardozzi, a senior horticulturist at the National Gardening Association. Morning, just before the sun rises, is the coolest part of the day, so the roots of the grass will soak up more water and stay hydrated. Plus, watering at daybreak help prevent plant diseases by preventing the grass from staying damp overnight. My hints: See our posts on water conservation for more tips. Carefully manicured, large, green lawns are going out of fashion. (Home & Food) - Scientists at the University of Michigan found the common idea that people want big homes and big lots may be a myth. Results of a new study show that people actually prefer a view of woods over a traditional lawn. This could be a huge untapped market for developers and tree-huggers. So put that mower away, sit back and watch the trees grow, instead! Not only is it the preferred landscaping, a natural view of trees reduces stress. 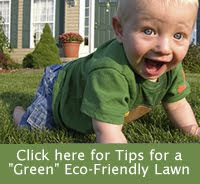 My hints: Check out the LawnReform website to find out alternatives to lawns. To find out where you can listen to John Tesh's Intelligence for your life, or to listen to him online, visit their website. Great round-up! We Lawn Reformers are happy to see Tesh carrying the good word – and we'll nudge him to take the reform tips even farther – toward less lawn, no pesticides, and a lot less watering, like this blog does. Keep up the good work, Metro DC Lawn and Garden, and Betsy in particular. Important tips that everyone should remember. Thank you for sharing.